In today’s long overdue post, I’m going to help put a stop to some of you from bleeding to death on the mound. I’ll say this til I’m blue in the face…. Most mechanical flaws, especially the one we’re going to discuss today are Man-Made! Most of today’s pitchers would be better off if they never asked a single question about how to engage the lower half. And would be a whole hell of a lot better if they stopped watching most of the pitching instructional and drill videos lingering around social media. But we both know that’s not going to happen. Luckily for you, I’ve got a solution. Let’s get to today’s post featuring BaseballThinkTank’s newest employee, Scott Lando. I met Scott year’s ago when he was training several MLB pitchers and one of those being Brandon Gomes, the Farm Director for the Los Angeles Dodgers. Without question, Scott’s one of my go-to guys when it comes to anything related to strength training, motor learning, conditioning, and even craps and boogie boarding. All around smart guy. Scott Lando’s a stud and definitely a guy you should follow on Instagram. He’s one of the best in the biz. Prelude: The video you’re about to watch took place at Pitch-a-Palooza’s Core Velocity Belt Bonus Night. (Btw- the event was attended by 437 coaches/instructors with MLB representing almost 34% of the attendees, by far the biggest core group. Most players lack the necessary kinesthetic awareness to move efficiently through the middle of their body, ie… hips. And because they lack the awareness, or proprioception, they’re unable to coordinate the simple movements required to effectively load the hips. 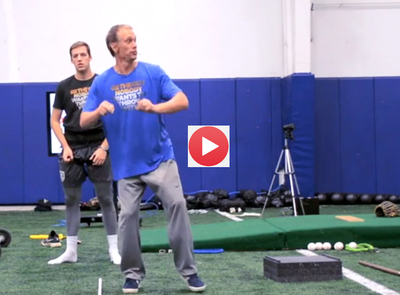 Instead of rotating, most players force their weight to the inside of the back leg/foot and push forward, creating premature hip extension and a host of other issues which appear later, downstream of the actual cause in the delivery. How to Corkscrew the Hips To Uncork More Velocity using The #CoreVelocityBelt ⁣ ⁣ Here’s one of the best minds in the game @Scott_Lando. He’s my go to guys when I have questions. (Give him a FOLLOW)⁣ ⁣ The key to unloading the Hips starts by loading them. It’s impossoble to unload what hasn’t been loaded and that’s the case for so many lower body actions ⁣ ⁣ To #RidetheSlide (getting your hips connected to mirror the slope) requires hip proprioception. You gotta FEEL it ⁣ ⁣ – Most players allow back knee to get inside foot and end up pushing their hips down the hill ⁣ ⁣ – this kills any chance for effective rotation and also leads to pushing the baseball ⁣ ⁣ At the end of the day…⁣ ⁣ Your arm is at the mercy of your hips! P.S: We’ve got two camps scheduled next month.